Beat butter at medium speed with a heavy-duty mixer until creamy. Add 2 1/2 cups sugar, beating 4 to 5 minutes or until fluffy. Add egg yolks, one at a time, beating just until yellow disappears. Combine flour and baking soda; add to butter mixture alternately with sour cream, beginning and ending with flour mixture. Stir in flavorings. Beat egg whites until foamy; gradually add 1/2 cup sugar, 1 tablespoon at a time, beating until stiff peaks form. Fold into batter. Bake at 325° for 1 1/2 hours or until a long wooden pick inserted in center comes out clean. Cool in pan 10 to 15 minutes; remove from pan, and place on a serving plate. While warm, prick cake surface at 1-inch intervals with a wooden pick; pour warm Buttered Rum Glaze over cake. Let stand 4 hours or overnight before serving. 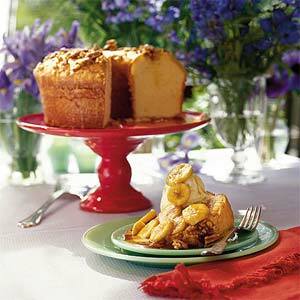 Serve with Bananas Foster Sauce and vanilla ice cream. Lemon Pound Cake: Add 2 tablespoons grated lemon rind to batter. Proceed with cake recipe as directed. Omit Buttered Rum Glaze; do not serve with sauce. Combine first 4 ingredients in a small saucepan; bring to a boil. Boil, stirring constantly, 3 minutes. Remove from heat, and stir in pecans. Combine first 4 ingredients in a large skillet; cook over medium heat, stirring constantly, until bubbly. Add bananas, and cook 2 to 3 minutes or until thoroughly heated. Remove from heat. Heat rum in a small saucepan over medium heat (do not boil). Quickly pour rum over banana mixture, and immediately ignite with a long match just above the liquid mixture to light the fumes (not the liquid itself). Let flames die down; serve immediately with Buttered Rum Pound Cake.